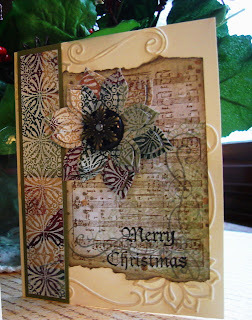 Vada's Blog Stamp Inks and Paper : "Anemone Flower” Christmas Cards. I’m hoping this flower will pass as a Poinsettia. Regardless I love the look of these cards. Stamp Credits are; Music Background from Impression Obsession, Hero Arts Swirls, Merry Christmas unknown. The boarder strip was made by Versa Mark and Clear Embossing powder then covered with Vanilla Acrylic Paint. I washed off some of the paint and let it dry. 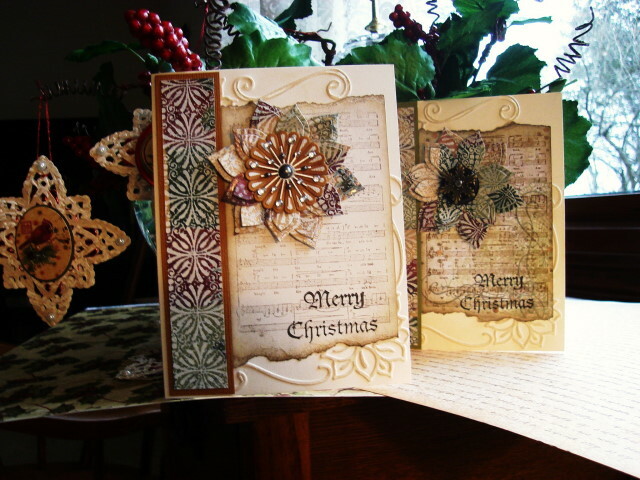 K & Company Christmas papers were used. Sizzix Embossing folder was stained with Versa Magic Chalk. Gorgeous rich colours and so elegant. 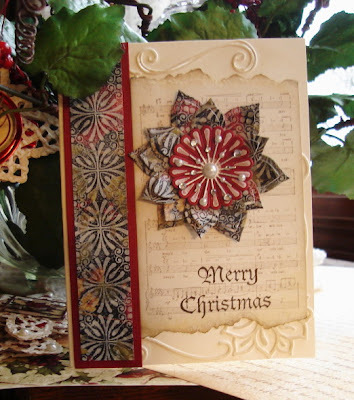 These cards would be suitable for the Fashionable Stamping Challenge which is I'm Dreaming of a White Christmas - the cards don't necessarily have to be white, we are looking for stamped, Christmas artwork. Just a thought. I love the vintage feel of these! the cards are wonderful! They have such a warm Christmas feel. Wow, this is totally gorgeous, Vada. I'm loving the stamped flowers and your gorgeous colors. Just beautiful!